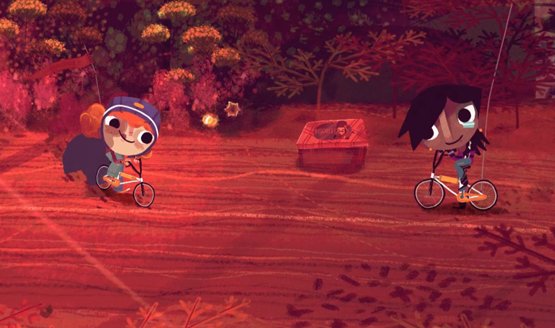 Knights and Bikes is a game all about imagination. Two kids are on an epic journey, and anything real is covered by their imagination. Mundane objects become important and interesting. It becomes a game of make believe as they see a fantasy where adults might see drudgery, simplicity, and everyday things. I previewed that game at last year’s PSX too, and while this year’s demo didn’t show me much new, it did cement just how much of a joy Knights and Bikes will be. Following two kids that are playing make believe, Knights and Bikes is about their adventure to save their island. Last year I was breaking into a carnival or fairground, and this year it was all about a junkyard, which is seen by the kids as a castle. What the kids imagine is seen as white outlines over the “real” world, and cleverly shows the how they bring the mundane locations to life with their minds. At one point we’re forced to leave our bikes behind and journey forward on foot. Getting to the crane (what we see as the wizard’s tower), we ask for the mighty wizard’s help. Of course, this just means controlling the huge magnetic crane so that we can eventually use it to pick up our bikes and drop them on the other side of the fence. As we go to leave the area and continue on our quest, one kid turns around and offers a wave, “Thanks mister wizard!” Imagination at its finest, as these kids see the world around them differently from the grown ups. Seeing the world differently includes picking up junk and seeing it as treasure. Pebbles, worms, and jakcs were among the many things I saw disappear into their pockets (or rather, get listed on the side of the screen as I collected them). Apparently the kids will come upon adults at some point in the game and need to convince them that this junk they have is actually valuable and worth a trade. I’m not sure if that means there will be an actual mechanic around that, or if that’s just the idea behind using junk at various shops in the game, but my guess would be the latter. Knights and Bikes isn’t so complex that you would need to convince adults of anything in some kind of gameplay mechanic. The devs have a prestigious history in the games industry, having worked at Media Molecule and Insomniac before starting FoamSword. Their pedigree shows in the way that Knights and Bikes kept me constantly smiling as I was playing. It’s filled with tiny details that take an otherwise simple game to another level. When One kid throws a water balloon, it can frizz out the other one’s hair. Boosting on the bike causes each one to make unique faces, with one hilariously sticking her tongue out as she zooms along. It’s these kinds of little details that bring Knights and Bikes to life. 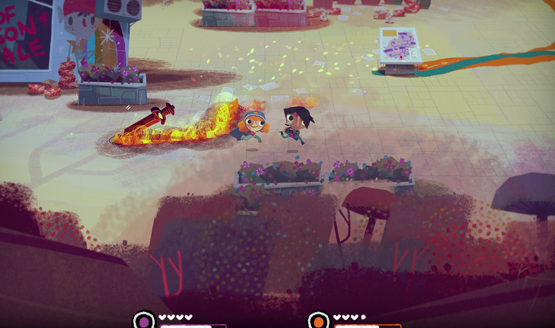 The art style really shows both the Media Molecule roots of the game’s artist, and the Double Fine publishing that is backing this game to release. It’s a brilliant blend between what I would expect from each of them. Knights and Bikes features couch co-op, but when a co-op player isn’t there, the other character will be AI controlled. Both character are required for many puzzles, so FoamSword is currently working on their AI and how much they will actually do unassisted. I don’t think I’ll ever find out if they manage this though, because Knights and Bikes is exactly the type of game I want to play sitting on the couch with my wife. If all goes well, we’ll be zooming around on our bikes playing make believe next year, and you’ll be reading a review of the game well before next year’s PSX previews start hitting. Knights and Bike preview conducted at PSX 2017.